"This is a very good pasta for family get togethers. It can be served hot, cold, or room temperature." Heat olive oil in a large skillet over medium heat. Saute garlic for 2 minutes, then stir in chicken, and cook until no longer pink, and juices run clear. Remove from skillet, and set aside. Heat 1 tablespoon olive oil. Saute red onion, green bell pepper, red bell pepper, yellow bell pepper and yellow squash until tender. 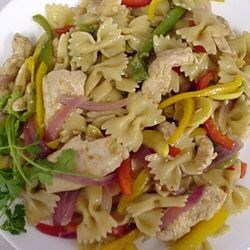 In a large bowl, combine pasta, chicken, pepper mixture, basil and balsamic vinegar. Toss until evenly distributed. I didn't think that the flavors blended well at all - until the next day. This dish is definitely better as leftovers. Takes a while to prepare, but well worth it! I will not make this again. It might have been the balsamic vinegar, it just wasn't very good. This was really good. My family really enjoyed it. I think next time I might leave out the chicken all together. Good either way. A wonderful and colorful dish. We will definitely have this again!